Cluttering muttering. Though you may not be familiar with the term, you’ve probably experienced it many times. Especially if your garage is like most garages: a cluttered mess! Think back to the last time you were searching for something in your garage; something, perhaps, that you hadn’t used in quite a while. Was it buried in the clutter? If so, you likely wasted lots of time sorting through all that ‘stuff’ cluttering your garage. Probably frustrated you so much that it set you to muttering under your breath. That’s cluttering muttering, and we’ve all experienced it far too many times. Let’s step away from your cluttered garage for a moment, and step into your kitchen. Now imagine emptying all the contents of your kitchen cabinets, dumping it all on countertops, tabletops, and even the floor. What a mess that would be! It would take you an eternity to find anything. Just simply preparing a meal would be an unbearable nightmare. And there’d sure be lots of cluttering muttering going on! Admittedly that’s a bit of a ridiculous scenario. After all, none of us would tolerate such a disorganized mess in our kitchens. Isn’t it strange, then, that many of us willingly put up with exactly that kind of a mess in our garages? Garage Storage Cabinets to the Rescue! There’s a wonderful array of purpose-made cabinetry just perfect for eliminating the cluttering in your garage. They’re available in steel for durability, wood for beauty, or plastic for thriftiness. They can be wall-mounted or free-standing. 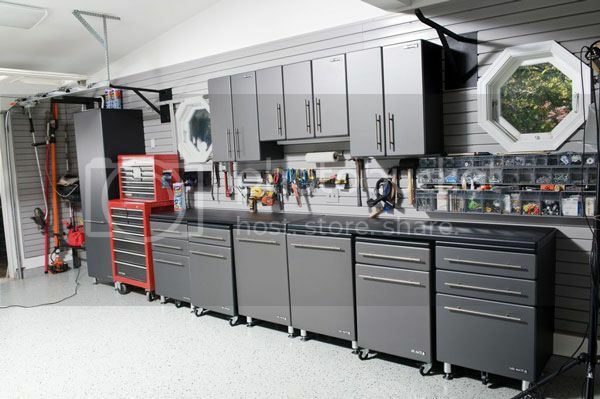 You’ll be amazed at the amount of storage space offered by a set of garage storage cabinets. Getting all that clutter off the floor and into the cabinets is also a great way to increase the usable floor space in your garage. And imagine walking into your garage and instantly laying hands on anything you need, just as quickly and easily as fetching a dish from your kitchen cabinets! The next time a certain somebody shoos you into the garage to get started with some dreaded chore such as mowing the lawn, you might still be doing some muttering. But if you’ve installed your storage cabinets, any disgruntled muttering occurring won’t be because of the cluttering. And it’ll take more than garage cabinets to eliminate that other kind of muttering! This entry was posted on Friday, April 12th, 2013	at 8:45 am	. You can follow any responses to this entry through the RSS 2.0 feed. Both comments and pings are currently closed.